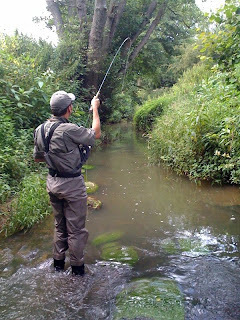 On Saturday I was privileged to fish this amazing Wiltshire chalk stream as a guest of member Tom Davis. Tom and I met at the Spring show in March this year and when we got onto discussing grayling he suggested I should experience the grayling of the Wylye. 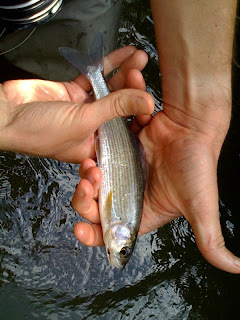 we fished a few of the club beats and they all produced grayling and a few out of season browns. The fish came mainly to the nymph in the morning but in the afternoon a good large dark olive hatch came off and we were into them with dries. We got quite a few fish, nothing huge but all were very strong and full of beans. 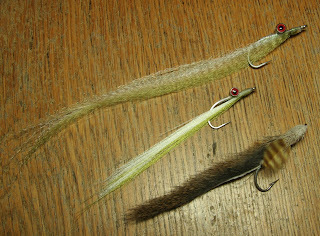 Tom got fish on a little parachute emerger with an antron trailing shuck and I got mine mainly on my "bootlace" adult olive which is a combination of CDC and, literally, boot lace fibres... the stuff floats like a cork: I discuss this pattern in "Fly tyers of the World Volunme 1". The Wilton Club has been around for 110 years and on the Wylye for about 100 years, so there is some history! We had lunch next to the river, about 50metres from us was a small, simple fishing hut. 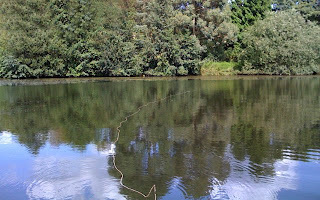 Tom told me that Skues had sat in that hut and had caught his last trout just upstream of it in the weir pool. Apparently the hut is featured in the book "Fishing Huts" by Jo Orchard Lisle. The club does an amazing job of maintaining and rehabilitating the stream. Salmon are spawning on the property which is wonderful. Tom showed me a number of areas where the club was doing various bits of rehabilitative work on the river bed and banks. Sorry there aren't many photographs, it was really cold and the last thing on my mind was getting out the camera. what an amazing day's fishing, thanks Tom. we had an amazing few days last week in the Scottish Borders with some very hospitable locals who ensured we were on some of the most beautiful pieces of river I've ever seen. I snuck out for a few hours on my neighbour's pond. The weather was perfect for fishing a small stillwater: a bright sky, slight breeze and warm day. With all the rain recently the rowing boat took a while to empty using the rusty old sauce pan but it offered me a few minutes to watch the water. There were a few unhurried rises, mainly along the fringes of the weed bed: the pond perimeter is almost completely weeded now with little opportunity to fish from the bank. Once on the water I noticed spent large white mayfly that must have emerged early in the morning, also there were quite a few large (#10) midge pupae emerging... 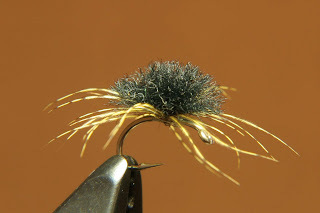 I suspended a suitable black midge imitation beneath a large buoyant dry. I've sought the advice of the experts, I think I am starting to get a good grounding for how the bass in the UK operate and what I need to do to catch them on fly (remember I've only been out once before where I got a wee schooly on a clouser). I had a good chat with Austen Goldsmith of UKSaltwaterflies.com who was a huge help. Amongst a lot of advice, Austen also sent me a few of his killer bass patterns. I'll tie up a few more with the materials he uses (like the DNA FFF stuff which just blows me away) before I hit the water hopefully next week. Austen also suggested I buy "Hooked on Bass" by Alan Vaughan and Mike Ladle and focus especially on chapter 5 "shallow rocky shores". That chapter did it for me... I spent the next few hours on Google Earth searching out appropriate pieces of coastline. I reckon I have had my nose up against at least 100miles of coast this past few days via Google earth! Last summer I was looking for a quick to tie, highly buoyant dry fly that throws a large silhouette on the surface without being bulky. I looked at yarn strike indicator material and reasoned that it is light and bouyant enough to be the basis of a pattern, but what about legs for silhouette? Partridge parachute style would do surely? If you were at the Spring show in March this year you may have seen me demo this pattern in various colours, it has also been featured in the new publication "Fly tyers of the world". It takes less than 60 seconds to tie and is really easy. Remember to apply some flexament under the shank where the partridge is hackled around the yarn post to ensure it is protected against those little teeth on wild brownies. 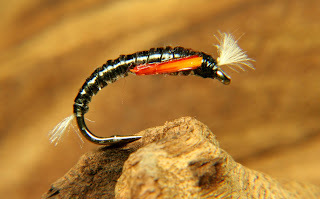 A light wire scud/emerger hook is best to keep the point below the surface where it will produce good hook up ratios on trout and especially grayling and yellowfish (for the South African readers) with their sub terminal mouths. Some of you may know me from my blog focussed on the yellowfish of the Vaal River in South Africa. I moved to the UK (Kent) from South Africa about 16 months ago: I've been fishing quite a bit in the UK since arriving, mainly for trout and grayling in Wales, the West Country and around Kent on what are now my home waters. I have also had a shot at sea bass on the fly with some success: I think Bass are under rated as a fly species in the UK and I look forward to getting to know them better given my proximity to the south coast... and it's summer! I'm going to blog whatever is on my mind regards flyfishing, flytying and the associated issues of conservation, sustainability etc... I'll try to keep it varied, not to be too serious too often and have fun... please give me feedback and post lots of comments! With all this sunny weather and given that we are in the middle (or maybe the end) of the maylfy season I had to get on the water this week. Boy am I glad I did! Those wild brownies threw caution to the wind and engulfed my mayfly nymph and adult patterns with conviction. 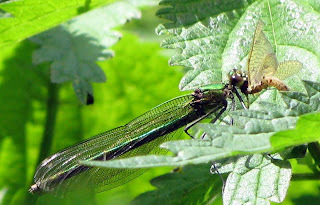 Does anyone know what the typical dates are over which the big Danica mayflies hatch in Southern England? I thought late May to mid June but they seem to still be coming off. Maybe, like so many things in nature, the mayflies don't follow the Roman/human calendar and track instead to the rythms of the seasons: so if the summer is "late" in terms of our human calendar the mays might emerge later into the summer, but on their calendar they are hatching consistently on water temperature or some other indicator of where they are in the progression of the seasons... make sense?